Dharamshala News,Daily News,Dalai Lama,Travel,Culture,Sports India. Let us renew our pledge to make 'Himachal Pradesh', a Carbon-Neutral State !".. 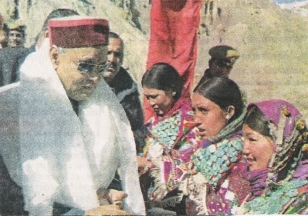 ..Professor P.K Dhumal; CM Himachal Pradesh. *For more on Eco-Tourism click on the graphic above. Dharamshala News..Sacred Waters of INDIA..2008 !
" Jesus was a sailor, when he sailed upon the waters, He said, No man will be free then until the sea shall free them, But He himself was broken, long before the sky would open, Forsaken, almost empty, He sank beneath your Wisdom like a Stone "
Dharamshala News: Sacred Renuka Lake in the Himalayas,2008 !, November 21, 2008, News Dharamsala India. The Renuka Lake, at a height of 660 metres, is regarded as the embodiment of Renukaji, the wife of sage Jamadagini and mother of 'Saint Parshuram', one of the ten Avtars of 'Lord Vishnu'. Shaped like a profile of a woman, the lake has the circumference of 2.5 km and is the largest lake in Himachal. Millions of pilgrims visit this holy shrine in Nahan, Himachal Pradesh. Dharamshala News: Healing Waters of GOA, India ,2008 !, November 21, 2008, News Dharamsala India. The Basilica of Bom Jesus is one of the most visited pilgrimage sites around Goa. The 'healing waters' of Goa brought St. Francis Xavier on the ship of Santiago from the port of Lisbon. On May 06, 1541 he reached Goa and went on a mission to preach the 'Words of GOD'. Cosimo de Medici III, Grand Duke of Tuscany, gifted the embalmed body of the saint, who died in 1552 during his sea voyage, to the church. The following year, according to his wishes, his remains were transferred to Goa. It was found that the saint's body was as fresh as the day it was buried. Today, the body lies in an airtight glass coffin positioned in a silver casket crafted by a 17th century Florentine jeweller, and is made visible to the public, every ten years. **While we salute all those who work hard to protect our Waters and conserve our precious Marine Life, we as part of the Global Family..must each make our own vow, to NEVER ever do anything to harm the sacred sanctity of our Waters !! 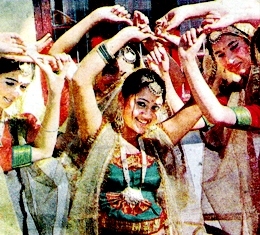 Himachal Dance Form...DAV Middle School, Shimla, Himachal Pradesh. 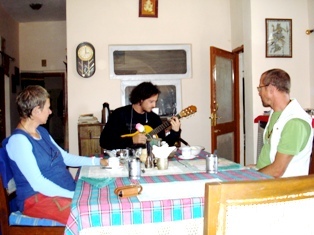 Dharamshala News: Body, Mind & Soul in the Himalayas,2008 !, November 17, 2008, News Dharamsala India. 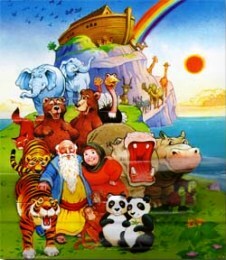 "An Artist is GOD, when he creates and His Vision, 'PARADISE' !" Active Yoga Education, Vedic Meditation traditions and Cultural Art Form Developments..are the Soul of 'Spiritual INDIA', which has much to offer to the World from the windows of the 'Health & Healing' traditions of our country..India INCREDIBLE ! For more on 'Spiritually Energizing' Holiday Brands...CLICK HERE !! 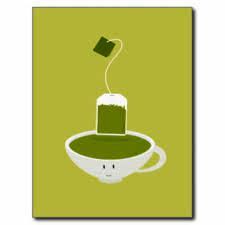 The 'Kangra Tea'...Buy NOW at HP Govt. Outlets, 2008 ! Dharamshala News: Kangra Tea Produce in the Himalayas,2008 !, November 16, 2008, News Dharamsala India. The Department of Cooperative of the Himachal Pradesh Govt. is now opening its outlets for the fair sale of the famous 'Kangra Tea' to the public, which has its unique flavours worldwide..a boost for the Tea Tasters around the Globe!! Dharamsala News: Sobha Singh Art & Craft Festival in the Himalayas,2008 !, November 16, 2008, News Dharamsala India. The Sobha Singh Art & Craft Festival is being held in Kangra displaying the famous Himalayan Art forms. 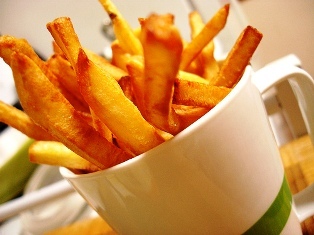 'Pahari Aloo'(Himalayan Potatoes)..French Fries All the Way..!! Dharamshala News: Himalayan Potato..a New Lease !,2008 !, November 15, 2008, News Dharamsala India. The Director of the Central Potato Research Institute has been awarded the 'Fellowship of the Prestigious National Academy of Science', for his research on 'potato cultivation'. Special mention is his study on the techniques of 'post harvest' handling of production of potatoes, for 'French Fries' & 'Chips'! 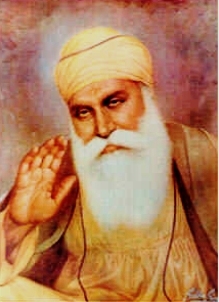 Dharamshala News..Shri Guru Nanak Devji...Sardar Sobha Singh Art Gallery. CM of Himachal Pradesh, Prof. PK Dhumal being presented by traditional gifts of 'Chang' and 'Aari' in Kaza, Spiti Valley ! Dharamsala News: Cabled Power Wiring in Himachal Pradesh,2008 !, November 12, 2008, News Dharamsala India. The Govt. of Himachal Pradesh is initiating to lay underground cabled electricity wiring to make the Himalayan State beautiful and thunder resistant. Dharamshala News..UNESCO WORLD HERITAGE: The Himalayan Steam Engine.. "Shimla TOY TRAIN", 2008 ! "It is in our collective interest to work on early 'Warning Systems for Disaster Management' for natural calamities. The challenges of financial crisis can only be surmounted through International Cooperation and collective action by the Global Community." ...Smt.Ambika Soni, Tourism Minister at the 84th UNWTO Executive Council Meeting at Madrid, 2008. ** " No work stains a man who is pure, who is in harmony, who is master of his life, whose soul is one with the soul of all !" In today's times, when some of your nearest relationships are based on convenience and need, in today's era, when some associations..have the sound of empty drums, which make too much of noise..with too little substance in them..,it is time for us to 'value' all those who come to 'us', with their Heart n' Soul ! Like the changing Seasons of Mother Earth, every relationship needs to be assessed at its own individual 'merit' irrespective of kith, kin and near dear ones ! Genuine relationships have the 'healing warmth' of Winter Sunshine, Care, Concern & Trust. They need to be treasured and valued above all. !! On my birthday, I had affection and care from my husband, children and my dear old pets, good wishes and companionship from many of my Global friends and guests ! Specially touching, was the birthday strumming of the guitar and a Japanese wish.. for a Life as beautiful as an Ikebana !! This week-end gift your child with the 'fine art of living', of nuturing the Heart and building a Global Family. Like they say " Wealth without Happiness, is a painful burden to carry in Life's Journey !" Dharamshala News: Disaster Management in the Himalayas, Himachal Pradesh,2008 !, November 11, 2008, News Dharamsala India. Mock drills were held in Shimla for earthquake management, in view of a national disaster management policy being made and approved by the Govt. Dharamshala News..For more on UNWTO Tourism..CLICK HERE ! Dharamshala News: ECO-Fund,Himachal Pradesh,2008 !, November 06, 2008, News Dharamsala India. An Environmental Fund, has been setup by the Govt. of Himachal Pradesh for the protection of environment and eco-related activities in the State. To start with contributions will be made by the Chief Minister and Cabinet Ministers. All voluntary donations can be made to the Director of Environment and the State level offices of the Department. 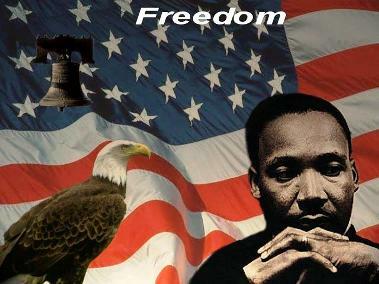 Martin Luther King (Jr)..A Peace Maker in History ! ** " A genuine leader is not a searcher for consensus but a molder of consensus. " ** " We who engage in nonviolent direct action are not the creators of tension. We merely bring to the surface the hidden tension that is already alive. " ** " Nonviolence is a powerful and just weapon. which cuts without wounding and ennobles the man who wields it. It is a sword that heals. " Dharamsala News: Celebrating Jayanti Temple,Kangra,Himachal Pradesh,2008 !, November 04, 2008, News Dharamsala India. Pilgrims from all over the world will celebrate the Panch Bhism Fairs starting from Sunday, at the ancient holy shrine of 'Mata Jayanti'..the Shakti Goddess nestled in the vicinity of the Kangra Valley. Dharamsala News: Hamirpur Mahotsav,2008, Hamirpur,Himachal Pradesh,2008 !, November 04, 2008, News Dharamsala India. The Himalayan town of Hamirpur celebrated the Mahotsav by organising art & cultural exhibitions of the state, promoting the skills of the local artists and artisans. It was attended by the political,social dignitaries and art lovers from all over India. 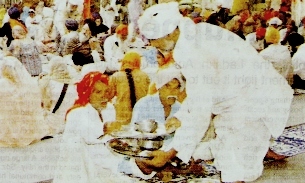 Sikh 'Khalsa' Sports Festival, INDIA, 2008 ! 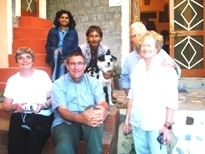 Dharamsala News: Fossil Discovery,Himachal Pradesh,2008 !, November 03, 2008, News Dharamsala India. During excavations at the Shoghi-Seri site near Shimla, a fossil like rock has been discovered. An expert panel will inspect and give its opinion. The fossil rock appears to be a massive jaw of the extinct creature...Could Dinosaurs have roamed in the Himalayas?? 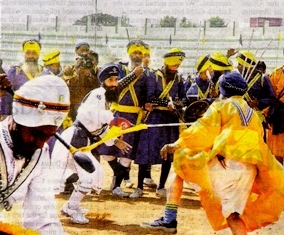 Dharamsala News: Sikh 'Khalsa' Sports Festival,INDIA,2008 !, November 02, 2008, News Dharamsala India. If ever you pictured "An Indian Knight", it would be a pompous, horse-ridden, turbaned Sikh 'Khalsa' warrior brandishing his magnificient sword and 'kirpan'. The famous Martial Art Games reflect the courageous spirit of the Sikh community hailing from the Lion-Hearted, North Indian state of Punjab !! Dharamsala News: Chamba Rumal..A Himalayan Bond,2008 !, November 01, 2008, News Dharamsala India. 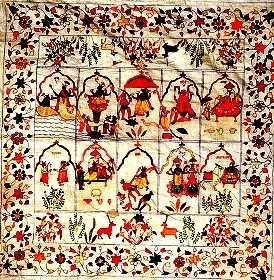 A friendship bond from the Chamba Valley..the 'Chamba Rumal' (Hand-Woven Handkerchief), is now Internationally recognised as the ethenic handicraft of the people of Chamba Valley, Himachal Pradesh just like the 'Kullu Shawl'. This is an ancient village craft from the 18th century and still has its roots in the local villages. Dharamsala News: Himalayan Prayers,2008 !, October 30, 2008, News Dharamsala India. Our Heartfelt Sympathy to our dear Himalayan family of Assam, affected by the untimely tragedy in the Tea State of the World. Our prayers our always with you and the dear departed...! Dharamsala News: 'Happy Vishwaskarma Day',2008 !, October 29, 2008, News Dharamsala India. 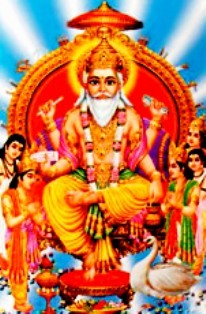 Lord Vishvakarma, is the Supreme deity of all craftsmen and architects. He is the "Principal Universal Architect", who fabricated and designed the divine architecture of the Universe at the behest of Lord Brahma, the God of Creation. In Hindu mythology, Viswakarma is considered as the Divine Architect. He is called 'Devashilpi' or 'The Architect of Gods' . His mother was Yogasiddha, sister of Brihaspati. 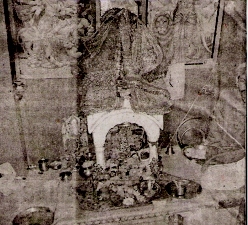 His father was Prabhas, the eighth hermit of the legendary Astam Basu. The 'Rig Veda' describes Viswakarma as the god with multi-dimensional vision and supreme strength. According to the Hindu mythology it is Viswakarma who created the entire universe as well as the heaven and the earth. He has four hands with a water-pot, a rope, a book and craftsman's tools.The Vedic essence of the Puranas of the creator, is Viswakarma. The Sacred Puja..Vishwakarma is known as the divine engineer since the Puranic age. As a mark of reverence he is not only worshipped by the engineering and architectural community but also by all professionals. It is customary for craftsmen to worship their tools in His name. Vishwakarma Puja is celebrated by all industrial houses, artists, craftsman and weavers. The festival is observed on the Kanya Sankranti Day (September/October) which follows the Lord Ganesh Puja. Ancient Hindu legends reveal that, it is Vishwakarma who designed the 'Triloka; the tripartite universe consisting of the mortal world, the heavens, and the netherworld. Vishwakarma is also credited for creating the missiles used in the mythological era, including the Vajra the sacred weapon of Lord Indra (a parallel of Zeus' thunderbolts) from the ribs of sage Dadhichi. He is regarded as the supreme worker, the very essence of excellence and quality in craftsmanship. *We wish to all our great artisans, engineers, craftmen and the builders a Great VishwaKarma Day, 2008 all over the World ! Have a Green Day,...A Greeting from The Himalayas ! "Wishing all our Dear Surfers all over the World...HAPPY DEEPAWALI, 2008 !! 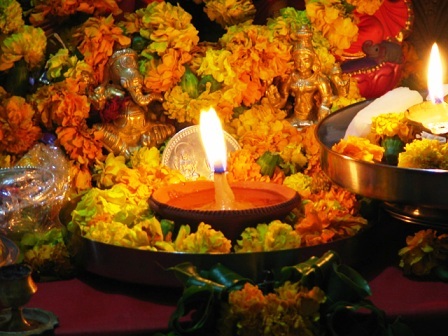 We pray it brings in Peace, Prosperity and Happiness to our Beautiful World we live in...Have a GREAT 'GREEN DIWALI' !! Arvind & Sangeeta Gurung from the Himalayas !! 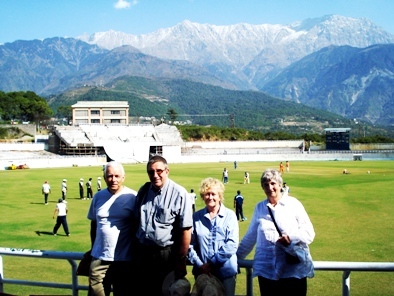 Sue,Bill, Viv & Trice from UK & Australia, enjoying Cricket in Dharamsala,India ! Dharamsala News: Travel in Green - Sports Tourism in the Himalayas,2008 !, October 24, 2008, News Dharamsala India.
" We found 'Nirwana', during our stay. Thanks in particular for reading the Black Swan, allowing us to laze in the awesome Cricket stadium and the lovely nature treks. " " Our visit was spectacular and a gastronomic delight at Vidya Niwas. We have made new friends, discovered much and are looking forward to coming back again for more 'cricket' in the near future. "...Sue,Bill,Viv & Tris. **Being a Tour Operator and doing 'Travel in Green' Tour programs for sustainable Tourism can be as learning and enjoyable experience for us, as it is for the 'Guests' ! ...Dharamsala Tours & Travels, Dharamsala (HP), INDIA. Dharamsala News: Trek for Physically Challenged in the Himalayas,2008 !, October 23, 2008, News Dharamsala India. The Mountaineering Institute in Himachal, has arranged the soft trek in the Himalayas for the 'physically challenged' children. The initial training is taken by the kids in this camp before the trek. A positive initiative for 'green tourism'! For more on 'Incredible INDIA..Travel in GREEN, Dharamshal News..CLICK HERE ! 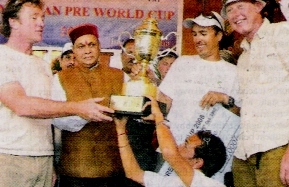 Dharamsala News: Pre-World Para Gliding Award in the Himalayas,2008 !, October 22, 2008, News Dharamsala India. The Pre-World Para Gliding Championship ended in Billing, with Andreas Malecki emerging as the overall champion. The award occasion was graced by CM of Himachal Pradesh, Prof. PK Dhumal giving the Award. The HP Govt. is now eyeing hosting the World Para Gliding Championship by improving the existing infrastructure, for the future. Dharamsala News: Environment College in the Himalayas,2008 !, October 17, 2008, News Dharamsala India. The Himalayan state of Himachal Pradesh will get the first College of Environment Science at Bhota in Hamirpur district soon in near future. Dharamsala News: Dharamsala New Auditorium,2008 !, October 16, 2008, News Dharamsala India. Himachal 's Transport & Urban Development Minister, Shri. KK Kapoor has announced the opening of a new Sports Auditorium in Dharamsala, Himachal Pradesh. Dharamshala News: HRTC Award,2008 !, October 16, 2008, News Dharamsala India. The Himachal Road and Transport Corporation, had bagged National Awards for Highest Fuel Efficiency and Minimun Accident Rate. 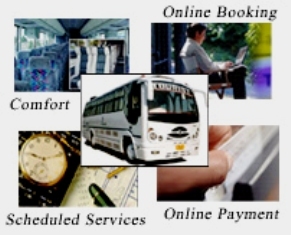 The Corporation has a good network of buses AC and Non-AC, all over the Himalayan State providing good revenue and accessibility to all major towns and local villages. 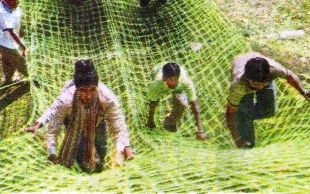 Dharamsala News: Trout Export,2008 !, October 12, 2008, News Dharamsala India. "Trout farming is going to be open for direct export of the product to many international countries, with the setting up of a vacuum packaging plant in Kullu district." Dharamshala News:- Butterfly Park, October 12, 2008, News Dharamsala India. 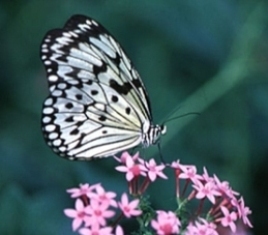 "The Council of Science and Technology has decided to set up a butterfly park at Shogi near Shimla. It will be dealing with 'Eco-Tourism'.. a big help for the Conservation of the colorful but highly endangered species of butterflies." Dharamsala News:- Dalai Lama Health, October 12, 2008, News Dharamsala India. "The Himalayan people of the state, pray for the quick recovery of the HH. Dalai Lama's health and look forward to his return to Dharamshala from Delhi, where he has undergone surgery." Dharamshala News and India Updates click here!